Be prepared for the warm weather with some frozen lemonade concentrate. Naturally sweetened and only 3 ingredients make this a great summer treat. A great way to use up lots of lemon and preserve the season. Simply run the jar under hot water for 20 seconds and blend with filtered water for a delicious cooling lemon slushie. 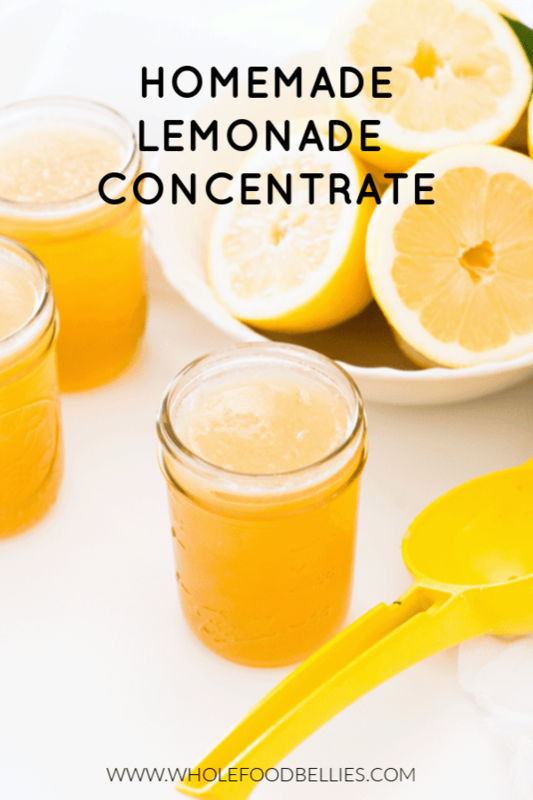 Why Make Lemonade Concentrate At Home? To be honest I had never heard of ice lemonade concentrate before moving to the U.S. When I first arrived I was quite surprised to find a huge selection of frozen ‘juice’ concentrates at the store. 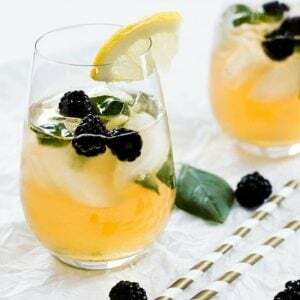 But now that the summer heat has hit, and we have been enjoying iced lemonades in the backyard every day, I totally understand how it could be helpful to have some stored in the freezer so I don’t have to stand there making juice every time. Especially when unexpected guests pop over. The store-bought version has a bit too much ‘stuff’ in it for my liking, so I decided to make my own, and just sweeten it up with some honey. It is so easy to make and is a great way to use up all those never-ending lemons on the lemon tree. I freeze mine in little mason jars, as we don’t drink much at a time. When someone comes over, I run the jar under some warm water for about 20 seconds, and then it slides right out. Perfect for whipping up some slushies. Juice some lemons, mix them with some honey syrup and pop into the freezer until needed. See, easy! Lemon Parmesan Chicken with Garlic Butter Veg. I added more lemon and ice and it turned out great! I wasn’t so sure at first but it turned out very well. Thanks for your recipe. YUM! I love Arnold Plamers! This is a great idea! What a brilliant idea??? I am definitely gonna try this out! But I am really curious as to the kind of project that could use lemonade lids!!! Hmm…. What a refreshingly great idea!! I freeze all summer fruits!! I never added honey before.. interesting. Me too 🙂 We end up with sooooo much fruit at this time of year! I’m so excited about this recipe! 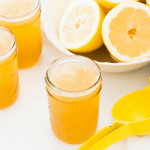 I absolutely love lemons and this is a genius way of making an easy healthy lemonade concentrate to have on hand for parties or summer sipping! Thanks so much!